The Sample Network Turns 7! Some people celebrate anniversaries. We like to think of it more like a birthday! We want to thank everyone who has helped us over the years successfully build a solid reputation as a friendly, responsive and superior customer service solution in the online market research industry. 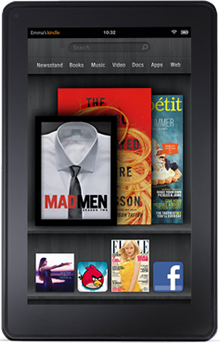 As a thank you for 7 wonderful years we wanted to give away a Kindle Fire for our birthday gift to you. To enter for your chance to win a Kindle Fire leave us a birthday message in the comments section below. Make sure to leave your name and email address so that we can contact the winner. Happy Birthday The Sample Network, may you have many many more! We look forward to many more! Thanks, Jason. Good luck in the drawing. Happy Birthday to some of the best people I have ever worked with!!! Miss you all!! You ROCK, Ken. We miss you too!!! Good luck in the drawing. Happy Birthday, Sample Network!!! Hope it’s your BEST year ever!! Thanks, Sheila! Good luck in the drawing. Happy birthday to The Sample Network! I love working with you guys! Thank you, Angela! Good luck in the drawing. Thank you, Kelly! Good luck in the drawing. Congrats TSN! Here’s to seven more! Thanks, Tyler, we are looking forward to it 🙂 Good luck in the drawing! Sample Network rulez! Happy birthday! Thanks for all your help over the years! Couldn’t do it without you. Happy Birthday Sample Networkers! Always great to work with you, and now I know we practically share a bday, mine was on the 16th. Happy Birthday and Thank You for all the work you quickly pulled together! Thanks, Angel and good luck! Happy Birthday – it is always a joy to work with all of you and I hope the year ahead is a great one for all of you! Happy 7year Birthday to the Sample Networkers!! You do good work, and the friendly, helpful attitude goes a long way.”Kindle the Fire” and keep the fire of the network burning!! Happy Birthday TSN Team!!!!! Wish you a great year ahead!!!!!! Happy Birthday!! You don’t look a day over 6. Congratulations! You won the Kindle Fire 🙂 We will be emailing you directly.